These Terms of Business (ToB) relate to the terms under which our services are provided to you and are effective from the date of issue. These are our ToB upon which we intend to rely. For your own benefit and protection you should read our ToB carefully before consenting to them. If you do not understand any point, please ask for further information. Our contract with you will be made up of these ToB and a Client Services Agreement letter, which will describe the services we agree to provide and will include an estimate of our charges for the agreed services and the agreed basis for payment of our charges. The expressions “we” “us” and “our” are taken to mean Chase de Vere Independent Financial Advisers Limited. The expressions “you” and “your” are taken to mean you, our client. of protection under the regulatory system and should have the right to take any complaint to the Financial Ombudsman Service. Details of our complaints procedure are available on request. We provide independent financial advice and having assessed your needs and circumstances we will make a personal recommendation for you based on a fair and personal analysis of the market. We will assess a sufficient range of relevant products available on the market, which will be sufficiently diverse with regards to their type, their issuer or product provider to ensure that your investment and protection objectives can be suitably met. Our advisers are not limited in any way that presents a risk of impairing the independent basis of the advice provided. deposits and other retail investment products. We also provide independent advice on insurance products. In doing so we are an insurance intermediary, acting on your behalf, not on behalf of any product provider. We offer an initial consultation, which is without charge or obligation. We use this to explain our services, our charging structure and your payment options and to answer any questions you have. We will tell you if you have to pay VAT and if there are any other costs that might arise in connection with the services we provide. The charges set out in this document do not generally include any VAT which may be payable. An estimate of our charges for our services will be included in your Client Services Agreement. The actual charges for our services will be confirmed to you in a Suitability Report or other product disclosure information provided to you. We will not charge you until we have agreed with you how we are to be paid. All charges become payable on completion of our work. Should you decide to terminate our services prior to all works having been completed, we will charge you a fee based on the adviser’s hourly rate which is commensurate with the amount of work completed. The charges for our investment services (inclusive of pension advice) as set out overleaf reflect a single offering that comprises both our initial advice and ongoing investment services. to select an ongoing investment service without first receiving initial investment advice, nor will you be entering into multiple agreements in respect of these services. initial investment advice and ongoing investment service] because this allows you to see the charges you will incur in respect of each component. Although our total charge comprises both of the components described above, you are entering into a single agreement for our provision of investment services to you. Our charges are calculable on three bases, either as a percentage of the investment amount to be advised on, as an hourly rate or as a fixed fee. Your adviser can explain these options further. If you require advice on an investment of £100,000, this will attract a charge of 3% of the investment amount (£3,000). If you require advice on an investment of £550,000, this will attract a charge of 3% on the first £500,000 (£15,000) and a charge of 2% on the next £50,000 (£1,000), making a total charge of £16,000. Selecting an hourly rate as the basis on which to pay for your initial investment advice may be appropriate where our service involves advising you in respect of a regular premium investment plan or providing you with general financial planning. A Pension Review will evaluate your occupational and private pension provisions and recommend a pension funding strategy to maximise your retirement savings and tax-efficiency. A review may take between 5 and 8 hours for your adviser to complete (depending on the complexity of your situation). There may be occasions where we will undertake work on a fixed fee basis, such as for pension transfer advice or for a pension tax report. If you require advice on transferring funds out of a defined benefit pension scheme and into another pension scheme, we will typically charge you a one-off fixed fee of £3,230 inclusive of VAT. 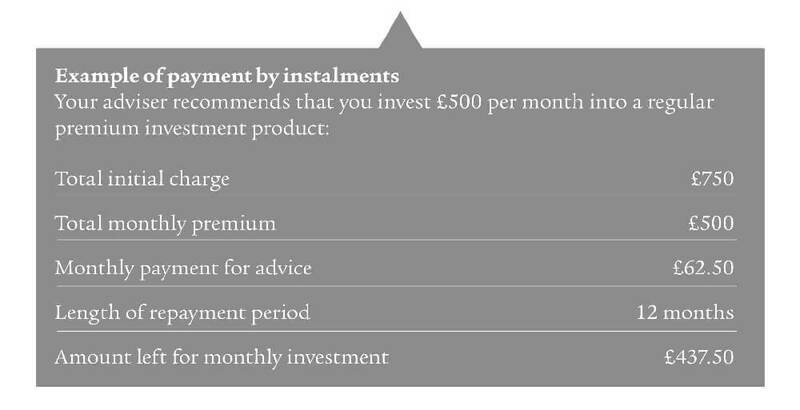 There is a minimum charge of £750 for advice on new investments. Rebalancing your investment portfolio to maintain an acceptable level of risk. Transferring existing investment funds into an individual savings account for tax efficiency. Replacing funds with which we have concerns with like-for-like alternatives. Tactical fund changes recommended by our Investment Committee. Our charge for new advice on existing investments is based on either a percentage of the investment amount on which we are providing the advice, or on an hourly rate. Your adviser can explain the options further. The percentage charge is based on the total value of investments under our advice and is levied against the amount of the investment affected. You have total investments of £100,000 under our advice. We re balance £10,000 of your investment portfolio to ensure an acceptable level of investment risk. This will attract a charge of 3% of the amount to be rebalanced (£300). Refer to our initial advice hourly rates above. The transfer of existing investments into or out of cash will be charged at 1% of the value of the investments transferred. There is a minimum charge of £250 for advice on existing investments. You can pay us a separate upfront fee by cheque or we can arrange for our charge to be deducted from your investment(s). Please note that if you choose to pay by deduction from your investment(s) this could reduce the amount left for investment. Your adviser will discuss the most appropriate method with you. We do not accept payments by cash. (regular premium product only) Where you invest in a regular premium investment product e.g. where contributions are made on a monthly, quarterly or annual basis, you can choose to have our charge deducted from your product through instalments. Although you may pay us nothing up front, this does not mean our service is free. You still pay us indirectly from the amount you pay into your investment. These deductions will pay toward settling our charge and could reduce the amount left for investment. Your adviser will agree with you the payment amount, its frequency and duration. Please note that we are unable to accept more than 12 payment instalments, nor can we accept payments made over a period exceeding 12 months. Please note that not all product providers can support this payment method. If your adviser recommends a product which does not support payment through instalments, you will be required to settle our charge as a separate upfront fee by cheque. Should you choose to settle our charge by instalments, these payments are linked to the ongoing payment of agreed regular contributions to your investment. If you fail to keep up these payments and if our charge has not yet been paid in full, we reserve the right to request full payment of any outstanding balance of the charge. We have an alternative approach for ongoing investment services received through The Chase de Vere Select Portfolio Management Service. Full details are contained in The Chase de Vere Select Portfolio Management Service Addendum Agreement. We offer three different levels of ongoing investment service. Please refer to our Private Client brochure for more information about our different ongoing investment services. Ongoing investment services apply to Primary, Enhanced and Premier clients, as well as our Discretionary Portfolio Management Service clients. Based on our Enhanced service, am investment of £100,000 may be subject to an ongoing charge of 1.08% per annum of the value of the investment (£1,080). In the absence of an investment amount upon which we can calculate our ongoing charge, or where the total investment amount does not meet our minimum charge for your preferred level of ongoing investment service, your adviser can agree a separate fee with you. Please note the actual costs of your ongoing investment service may vary accordingly with the changing value of your investment(s). We will confirm the charge, frequency and duration of the ongoing investment service in good time before it commences. To help minimise the cost of investing and to ensure fair value for clients receiving an ongoing investment service, the combined cost of our ongoing investment service and any new advice on existing investments recommended by us shall not exceed 2% of the total assets under advice in any given year. You can settle our ongoing charge as a separate fee by cheque. The charge will be based on a current valuation of your investment(s). Payments can be made annually, half-yearly or quarterly in arrears. Our ongoing charge will be reviewed annually. (ii) Direct debit/standing order You can settle our ongoing charge by direct debit or standing order. The charge will be based on a current valuation of your investment(s). Payments are made monthly in arrears. Our ongoing charge will be reviewed annually. We can arrange for your ongoing charge to be deducted on a regular basis from your investment(s). Please note that if you choose to pay by deduction from your investment(s), depending on investment performance, the total amount you pay could be higher or lower than if you pay by a separate fee. Your adviser will discuss the most appropriate payment method with you. We may continue to receive ongoing provider commission for investments established prior to 31 December 2012. Where practicable, we use these receipts to offset our total ongoing charge. However, below a defined monetary amount, the cost of offsetting smaller commission receipts against your ongoing charge outweighs the operational benefit, and would adversely and disproportionately affect our overall charging structure. Therefore, we do not attribute smaller commission receipts against our ongoing charge. It can take up to 30 days from our receipt of your cancellation notice to terminate your account. If you are paying in arrears for your service, we reserve the right to request full payment of any outstanding balance of our ongoing charge. This calculation is based on the time elapsed (to the nearest month) since your last payment. Any payment received after cancellation which exceeds the amount due for your ongoing service, will be returned to you as soon as possible. The minimum charge for our initial advice is £250. or your age when you start the product. We will tell you how much the commission will be before you complete a product purchase. In the unlikely event that you cancel the insurance product, we will be obliged to refund to the product provider some or all of the commission that has been paid to us. This is known as “clawback” and it can apply up to five years, known as the “clawback period”. Where commission is recovered by clawback, we will charge you the amount we have lost. If we exercise this right, you agree to pay us the lost amount on demand. We will confirm the exact amount that will need to be repaid by you and the timescale over which it will need to be repaid in the Suitability Report we will send you when a recommendation is made. We will not charge any such fee if you exercise your right to cancel in accordance with any cancellation notice sent to you by the life insurance company. Information about our mortgage and equity release services is provided in our Important Information about our Home Finance Services document, which is available upon request. You may ask us to act upon your instructions only, whereby we will not make a personal recommendation. If we provide you with services on this basis, we will tell you how we will be paid and the amount before we carry out any transaction for you. If you transact directly with a product or platform service provider, outside our services, should that transaction relate to an existing product for which we are the recognised servicing agent, this may result in a payment by that provider to us. In this situation we are not able to disclose that payment and consequently it will not be counted towards our agreed charge. We may receive minor non-monetary benefits from other financial institutions such as product and investment platform providers with the purpose of enhancing the quality of the service that we offer to you. Typically we would expect to receive support towards the continuing professional development of our advisers, such as participation in conferences, seminars and other training events where the benefits and features of a specific investment or service are explored in detail. We may also receive modest contributions towards food and drink during business meetings or conferences as described above. Any support received is entirely without prejudice to the unbiased and unrestricted nature of our financial advice and associated services. There may be other taxes and/or costs that are not imposed or paid via Chase de Vere. Any personal taxation liability will have to be paid directly by you. In most cases you can exercise a right to cancel by withdrawing from the contract. In general terms you will normally have a 30-day cancellation period for life and pension policies and a 14-day cancellation period for all other policies. at which point you may have a 14-day cancellation period. For life or pension policies, the start of the cancellation period will normally begin when you are informed that the contract has been concluded or, if later, when you have received the contractual terms and conditions. In other cases, the cancellation period will begin on the day the contract is concluded or, if later, the day on which you receive the contractual terms and conditions. Instructions for exercising the right to cancel, if applicable, will be contained in the relevant product disclosure information which will be issued to you. If you cancel a single premium contract you will have to bear any loss incurred in cancelling it which is caused by market movements. This means that, in certain circumstances, you might not get back the full amount you invested if you cancel the policy. We are not permitted to handle cash and cannot accept a cheque made out to us unless this relates to a fee to which we have sent you an invoice. Do not send money for investments to us as we cannot transmit this on to third parties and it will be returned to you. Chase de Vere Independent Financial Advisers Limited is authorised and regulated by the Financial Conduct Authority (FCA), 12 Endeavour Square, Stratford, London E20 lJN. Our FCA Register number is 137914. Our permitted business is advising and arranging investments, insurance, mortgage and pension business. You can check this on the FCA’s Register by visiting the FCA’s website https://register.fca.org.uk/ or by contacting the FCA on 0800 111 6768. Most types of investment business are covered up to a maximum limit of £50,000. However, on occasion we may advise on other financial instruments which are not regulated by the FCA under the Financial Services and Markets Act 2000. The FSCS does not apply to any of these and in other situations where the investment company counterparty is not located in the UK. We will inform you in which circumstances the FSCS protections do not apply. Insurance advising and arranging is covered for 100% of the claim on long term policies and claims arising from death or incapacity due to injury, sickness or infirmity of the policy holder. All other types of insurance are covered up to 90% of the claim without any upper limit. We will always endeavour to act in the best interests of our clients. However, circumstances can arise where we or one of our other clients may have some form of interest in business being transacted for you. If this happens or we become aware that our interests or those of one of our other clients conflict with your interests, we will write to you and obtain your consent before we carry out your instructions, and detail the steps we will take to ensure fair treatment. Swiss Life Holding AG has a direct holding representing 10% or more of the voting rights or capital in Chase de Vere Independent Financial Advisers Ltd. This shareholding does not alter our regulatory responsibility to provide you with impartial advice, and so should not influence our advice to you. Please ask if you want to discuss this in further detail. Our aim is to do the best that we can for our clients and this extends to ensuring that we transact our clients’ orders quickly, efficiently and with their best interests firmly to the fore. As a financial intermediary Chase de Vere does not physically buy or sell financial instruments on your behalf, however, we are highly involved in this process by transmitting the order to entities for execution. Where we transmit orders we will take all sufficient steps to obtain the best possible outcomes for our clients by taking into account various factors such as the price, costs, speed and other considerations that are relevant. One of the key decisions in this process is where the order will be placed and the product provider and/or asset management firm that we work with will decide upon the location or “venue” they feel is the most likely to achieve the best outcomes and place the order accordingly – this is known as “best execution”. This section sets out the manner in which we will execute transactions and place orders on your behalf, so as to obtain the best possible result for you, the factors which will influence the manner of execution and details of our execution venues. Investment Platforms: For investments held on a platform (an online investment administration service), client orders will be placed directly with the relevant platform. Stocks and shares: Chase de Vere does not use a preferred partner for buying and selling stocks and shares, but will refer clients to a stockbroker that meets our best execution criteria. As the world’s financial systems have developed, many investments can be traded at more than one venue. The entities involved in executing trades will give careful consideration to a variety of possible execution venues and select those which they consider will provide best execution for the orders in the majority of cases. Most of the investments recommended by Chase de Vere will be unit trusts and the venues considered will be selected by the individual unit trust managers (via a platform service provider). Other investments, such as UK equities and UK Exchange Traded Funds will be traded on the London Stock Exchange and ICAP Securities & Derivatives Exchange. Chase de Vere is unable to influence a firm’s approach to best execution, their choice of venue and ultimately the price achieved but we will consider their methodology as part of our research and due diligence process to ensure our clients gets the best outcomes. We will explain the details of the investments traded, the different parties involved in the execution of the order and the venue selected as part of your personal recommendation. If you have given instructions that price is not the most important factor in executing your instructions, we will make every effort to comply with your instructions but cannot guarantee this. This may be due to either the nature of the order, or the type of financial instrument you with to trade in. We will make all decisions as to where the orders are placed in relation to the execution venue. We will therefore not accept specific instructions from clients regarding the venue where your order is executed. it is being implemented correctly. In particular, this will cover the execution quality of any third parties referred to in the policy. This review will be carried out regularly (on at least an annual basis) or whenever a material change occurs that effects our ability to continue to obtain the best possible result for our clients. If any significant changes to this policy is made for whatever reason (including material changes to the execution venues we use), we will make this information available directly to our clients or on our website. April each year covering the previous calendar year. In meeting your investment needs and objectives as a retail client, Chase de Vere, as an independent firm, will consider a wide range of available retail investment products. We will ensure that we take into consideration various factors in the selection process such as risks, costs and the complexity of the available financial instruments. The range of products and services available includes but is not limited to life insurance policies, units in collective investment products such as unit trusts or open-ended investment companies, personal pension schemes, investment trusts and structured products. Our investment approach is generally suitable for retail clients and has been designed on the principles of modern portfolio theory using asset allocated portfolios. Our investment horizon is typically for the long term, however each client’s objectives are different and we will tailor our approach accordingly. Our recommendation will be set out in full in writing to you and will contain all the relevant details including particularly any investment risks that you need to be aware of, as different investment products will present different investment risks depending on the nature and structure of the investment. We will also explain specific details of the costs and charges associated with the recommendation. Our intention is to ensure that you have all of the information you need in order that you can make a fully informed investment decision. The service we offer is the provision of financial advice and we will continue to advise you on the investment products and services we recommend for as long as you want us to. Please be aware that investments can fall as well as rise and that you may not get back the full amount invested. The price of investments we may recommend may depend on fluctuations in the financial markets or other economic factors, which are outside our control. Where we provide details of past performance you must accept that part performance is not a guide to future performance. We are subject to legislation and regulation designed to prevent financial crime. We will check and verify your identity before conducting any business with you. In order to verify the information you provide, we may make searches with an identity authentication and address verification agency and/or fraud prevention agency. This will search against information from the electoral roll and any other database to which they have access. The agencies may record the details of the search with an electronic footprint showing it was done for anti-money laundering purposes. Companies may share these details in order to prevent fraud and to provide other companies with verification services. We may ask you to supply at least one original document of confirmation of your identity, address or both, which we will use along with any electronic checks we may perform. Any documents provided to us will be recorded and copied for audit purposes as part of our anti-money laundering requirements. These ToB exclude any rights which may be conferred upon third parties by the Contracts (Rights of Third Parties) Act 1999. English law and the English language (or Scottish law and language for the purposes of contracts and services arranged in Scotland). Chase de Vere Independent Financial Advisers Limited is the data controller of any personal data you supply to us. You can contact us at 60 New Broad Street, London, EC2M lJJ. Our Data Protection Officer can be contacted at 6th Floor, 8 Exchange Quay, Salford Quays, Manchester, MS 3EJ or at dataprotection@ chasedevere.co.uk. 17.2 How we will use your personal data. is that processing is necessary for the performance of a contract to which you are party or in order to take steps at your request prior to entering into a contract. orientation) political opinions) trade union membership) information about your health and genetic and biometric data)) we will obtain your consent when necessary to do so. We may also use your personal data for direct marketing purposes) but only where you have provided your consent to do so. You can ask us to stop sending you marketing messages at any time. You do not have to provide us with your personal data) but if you do not) we may not be able to carry out our “know your client)) checks) so we may not be able to enter into a contract with you and you may not be able to benefit from some of our services if we need to rely on any personal data you have not supplied in order to provide those services. 17.3 Who will we disclose your personal data to? We may disclose your personal data to the following) but will only do so for the purposes described above. You are entitled to ask us for details of specific disclosures we may make in respect of your personal data. The parties listed below are all located in the UK and will only use your personal data under our strict instructions and are contractually obliged to ensure appropriate security measures are in place. Except where we are required by our regulator or by law to keep your personal data for longer) we will only keep it for as long as reasonably necessary to fulfil the purposes described above. If you and we enter into a contract) we will keep your personal data for a minimum of seven years after the end of that contract and we will keep your personal data for marketing purposes only for as long as marketing our services to you continues to be a legitimate interest of ours. You have the right to ask us to confirm if we are processing your personal data and if so) to have access to your personal data and other information relating to how we use it. We will let you have a copy of your personal data which is being processed) if you ask us for one. The first copy will be free of charge. We will be entitled to charge a reasonable fee for any additional copies you ask for. We will provide the copy in writing, unless you ask us for it by electronic means. If you do, we will send you the copy personal data by email. the right to ask us to rectify it or to complete incomplete data and we will do so as quickly as we can. to erase your personal data if we need to retain it in order to comply with a legal obligation to which we are subject. One example of this is where our regulator requires us to retain certain records for a period of time and these records contain your personal data. If you are unhappy with the way in which we process your personal data or allow you to exercise your rights as described above or if you believe that we have not complied with our data protection obligations, you have the right to make a complaint to the Information Commissioners Office.. When it is necessary to provide our services without any personal contact, we will advise you if this requires the establishment of a separate agreement. In this instance you will be provided with additional information as required by the Financial Services (Distance Marketing) Regulations 2004. Any substantive changes to this ToB document will be notified to you in writing.